“These are the last few groups of humans who are really free, but we will kill them”, Sydney Possuelo states as a matter of fact. He should know, after a working life spent as a frontiersman in the deep Amazon. He has observed first-hand the rapid changes and increasing destruction brought about by capitalist exploitation of the virgin jungle. This is a powerful utterance to be sure, and it comes from one who really does know and he is not alone in his concerns, with other experts warning of entire cultures being wiped out in nations such as Peru and Brazil. Threatened by disease and deforestation, the world’s last isolated tribes in the Amazon are on a collision course with modern society. For his part, Possuelo spent decades working for Brazil’s National Indian Foundation (FUNAI), the federal agency responsible for the country’s indigenous people. During the 1970s and 1980s, his role involved making contact with isolated tribes and assisting in the process of relocating them away from resource rich areas where danger for them was higher, establishing new reservations for them. Over time Possuelo and others grew alarmed by the incredible death rate that followed contact events. 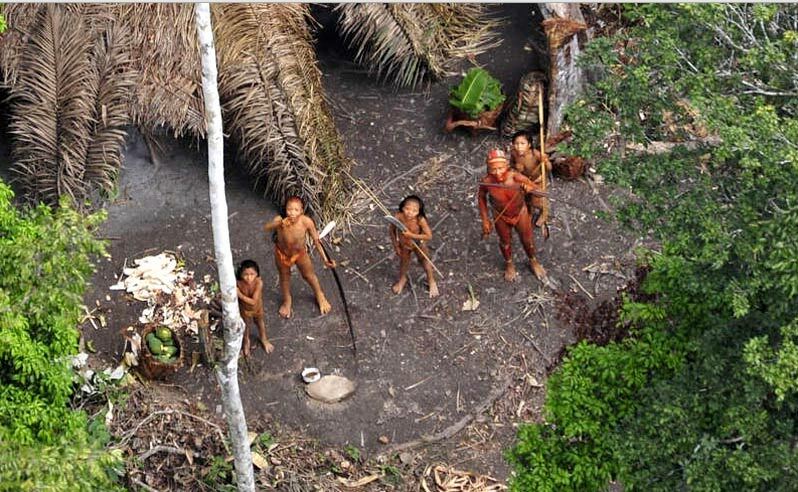 It became apparent that the tribes of the Amazon had no immunity to a wide range of diseases carried by outsiders. The flu virus was among the most deadly, spreading fast and causing death in between 50% to 90% of those infected. This shocking level of disease infection and fatality rates hadn’t been witnessed on the American continent since the first arrival of the Spanish conquistadors in the 15th century and during the period of their campaigns against the Indian tribes. In 1987, Possuelo and his associates came together to discuss this creeping accidental genocide and resolved to do all they could to put an end to it. 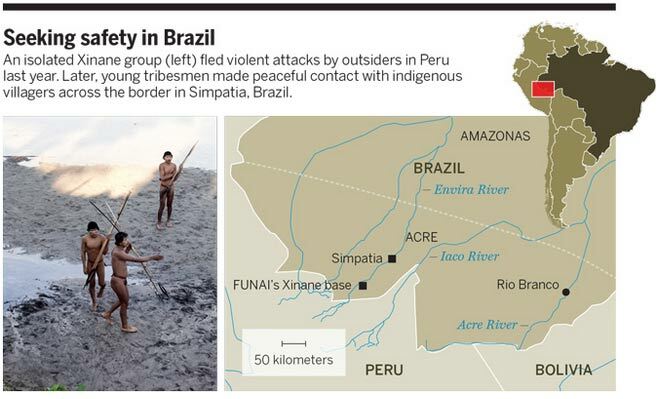 At a meeting in the city of Brasília, the frontiersmen of FUNAI agreed that contact was inherently dangerous as a practice, causing devastation for any isolated tribes-people. The new directive became one of zero contact, unless in exceptional situations such as where indigenous groups were facing extinction. They advocated a new practice be initiated, one that would start by mapping and then legally recognizing the territories of un-contacted tribes. Loggers, miners, and settlers would be kept out of these protected zones. Where contact might be unavoidable the onus would be put on avoiding disease infection and doing everything possible to prioritize the health situation for the tribes-people. The updated FUNAI policy eventually became a model used by a number of other countries where isolated populations still exist, including Brazil´s neighbour, Peru. In remote regions, FUNAI has already designated a dozen official front lines that they now protect from invasion, preserving the safety of tribes still in the remote regions of the jungle. These lines are dotted with frontier stations that are able to track tribal movements and sound the alarm if unwelcome outsiders presences stray to close. During an interview in February 2015, FUNAI’s interim president, Flávio Chiarelli, stated that his agency is “doing great” at protecting these isolated tribes. Newly contacted tribes report violent interaction with drug gangs and commercial interests. (Image source http://news.sciencemag.org). This statement by Chiarelli may be largely true, but a number of experts believe that the accelerating economic activity in the Amazon region is beyond the control of any agency and that inevitably the protection system will collapse. Brazil has the world’s seventh largest economy, with a gross domestic product in 2013 of $2.24 trillion. 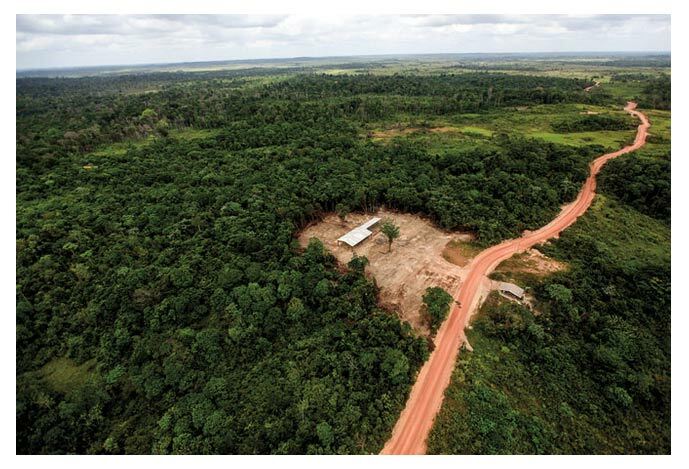 There are a growing number of public and private enterprises that view exploration of Amazonic resources as the prime direction for sustaining this level of economic activity, they are pushing deeper and deeper into the poorly charted areas of the Amazon jungle. Dams are built for energy, transmission lines are laid, mines dug, pipelines are installed and highways constructed. Less well recorded activity also occurs in the form of criminal organisations such as drug gangs that smuggle their product from Peru across the lands of isolated tribes, sometimes triggering attacks which rarely go well for the poorly armed indigenous groups. Illegal logging stations traffic in wood harvested in protected areas, causing devastation. Photo credit Ricardo Moraes (Image source http://news.sciencemag.org). With the increasing corporate and social expansion into the Amazon so too is there a corresponding increase in the rate of contact events. Between 1987 and 2013, FUNAI made contact with just five isolated groups. But that slow rate of contact now seems a thing of the past with three groups initiating contact during the past 18 months alone: the Xinane, the Korubo, and the Awá Guajá. Physician and public health specialist, Douglas Rodrigues, an associate of the Federal University of São Paulo, worries that the recent climb in contact events may be just the beginning. “I fear that we are facing a ‘decade of contacts,’” he says. There are growing concerns that FUNAI, the last line of protection, will quickly fall to the twin-pronged problem of corporate pressure and cash flow troubles. The last budget year for FUNAI have shown a high level of contempt by the central government, the required budget being nowhere near met, 15% of the requested funds being granted. FUNAI outposts are being closed and the patrol efforts are diminishing thanks to the visible the lack of government support. Thanks to immense efforts which include direct observations, field research and a an intense program of studying historical records from those that penetrated the deep jungle, FUNAI is aware of 26 isolated indigenous groups in Brazil, and believes as many as 78 more groups may be in hiding or on the run. Reports from recently contacted tribes suggest invading gangs of drug smugglers and others have been entering supposedly protected areas and killing tribes-people. As money and staff run perilously short for FUNAI, now able to operate only two specialized field teams but requiring at least 14, a dangerous situation is manifesting. In a moment when experts expect contacts with isolated tribes to increase the ability to save them from a looming genocide is crumbling away.